St. Hedwig is a Polish settlement founded much to the efforts of Father Leopold Moczgemba. He was responsible for the first organized group of Poles immigrating to Texas in 1854. Father Moczygemba wrote letters to families and friends in Silesia, then controlled by Prussia, to inform them of the opportunities existing in Texas. Soon after a group of Polish “farmers and small businessmen fleeing poverty, cultural harassment, and religious persecution by the Prussians, Austrians, and Russians” moved to Texas (McGuire 9). It was this group of people who had the greatest Polish influence in Texas. They settled first in the town of Panna Maria and from there, numerous other Polish communities began developing in South Texas. Fourteen families from this group of Polish immigrants settled, forming the town of St Hedwig on land belonging to John Demmer, a German. The original families were: Martin & Marya Cibis’ Tombstone Adam and Mariana Pierdola, Martin and France Pierdola, Joseph Mihalski, Florentine Tudyk, Mikolaj and Franciska Tudyk, Jacob Zaiontz, Thomas Krawietz, Anton and Frances Aniol, Paul and Franciska Kasmarek, Walter and Cecelia Stanush, Valentine Aniol, Frank and Mary Kosub, Martin and Mayra Cibis, and Paul and Franciska Kasmarek. Some of their tombstones can still be found in the church cemetary. John Dorstyn, a Polish immigrant married to an American, was instrumental in the settling of St. Hedwig. He helped the settlers overcome many hardships like language, for an example. John Dorstyn served as a translator for the Polish speaking immigrants. He too, is buried in the St. Hedwig church cemetery. The settlers soon built thatch-roofed log cabins, a log church and a school. St Hedwig was not the original name of the establishment. Because the Martinez Creek runs through it, it was called Martinez for several years until the Poles renamed it after the patron saint of Silesia (Baker 22). With these structures built, the town began to turn their attention to the miles of raw land. Planting corn and raising cattle were the first agricultural efforts in St. Hedwig. Soon, however, cotton production became the choice of farmers and continued into the early 1900s. Other families soon joined the small town of St. Hedwig from San Antonio and other areas. By the 20th century, St. Hedwig was once home to the second largest group of Poles (McGuire 16). Now, though the town often draws in families looking for a quiet, rural environment, it is among the smallest and lesser known spots in all of Texas. The Annunciation of the Blessed Virgin Mary was built in 1857. 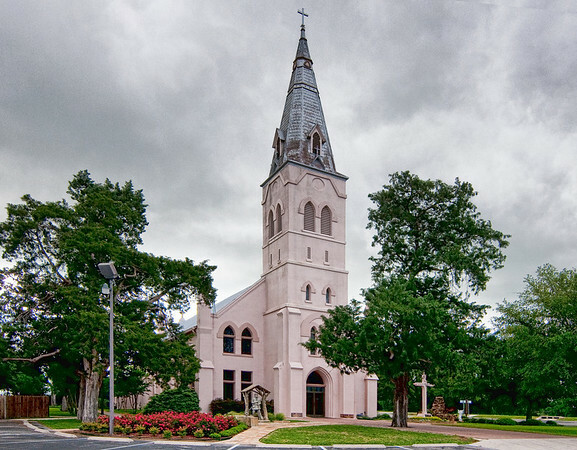 It was later replaced by a stone structure less than a mile southeast of the original, in 1868, after the Civil War. The first priest to serve the church was Fr. Julian Przysiecki, from 1857 to 1863. 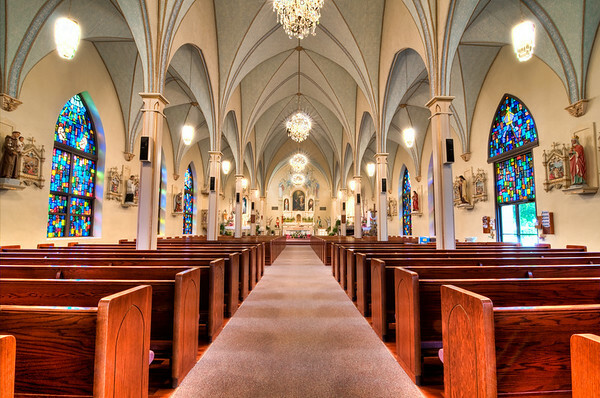 He performed the first baptism there on December 2, 1857 on Frances Pierdola who is buried in the St. Hedwig church cemetery. As time passed, the town grew rather rapidly. By 1900, during Fr. Zwiardowasis’s time, the church parish grew from 34 families to 200, making it the largest in the diocese. In 1938 church records show that the church had 800 members. Up until 1920, catechism was taught in Polish. The decision to begin teaching children in England came after WWI, when they began to realize the disadvantages of not being able to communicate outside the small town. They did not abandon their language however. Stations of the cross were still being done in Polish in 1955. Some locals can still speak Polish and even more have a definite Polish dialect. The Polish influence can be seen on the interior and exterior of the church. Inside there are numerous statues of saints, including St. Hedwig, the patron saint of Silesia. Murals typical of Poland line the church walls and gold paint trims all of the woodwork. The colors and vaulted ceiling are very much like that of the church built in Panna Maria as well as churches in Poland. The church is currently undergoing renovation on the exterior. Today, the only two-story structures in St. Hedwig are the occasional modern homes. There are a few important structures, however, which the town centers around. Of course the church is the center of this originally all-Catholic community. The school house, which served as a primary school under the instruction of nuns until 1969, is now the location of Christian education, or catechism, classes. Other focal points include the town social club, the feed store, general store, dance hall, American Legion Post and hall, fire department, post office, and convenience store. The St. Hedwig Social Club, regionally known as “Dutch’s”, is owned by the town’s mayor, Mr. Albert “Dutch” Strzelczyk Sr. What is now the social club was once a simple general store. Mr. Strzelczyk’s grandfather opened Strzelczyk’s Mercantile in 1879, a year after he came to America. Then, common goods were purchased in a building with solid dirt for a floor. Nearly 120 years later the building serves primarily as a pool hall and tavern. Through the club is old and seemingly run down, it is a spot of relaxation for several working locals and its appeal has reached far greater distances than the city limits. A portrait of the exterior of the building and close surroundings has been sold in West Virginia and the site was used for the production of country music star, Tracy Byrd’s music video “Walking to Jerusalem.” Dutch Strzelczyk, as the owner, spends most of the day at the club, but is an avid pool player himself, competing in numerous tournaments with other small towns in the area. In fact, while others were nervously awaiting the results of the towns first election in 1981, Dutch was playing pool in nearby China Grove. After its incorporation in 1957, the town remained without a city council until 1981. It was then that the city petitioned to elect officials. Mr. Strzelczyk is still the mayor today and says that he will not be running again in the next election, but only time will tell. It is easily assumed that the town has a conservative, Republican outlook on the governing of itself because they have repeatedly chosen a mayor who himself, did not want to elect officials and only ran to ensure that there would not be much of a government. Another interesting spot in the town is Lubianski’s. This feed and general store has been opened since 1949. Connected to the back of the stores is a dance hall. The hall is often used for dances or weddings in the community. Lubianski’s like Dutch’s is a family owned and operates business that thrives off of the rural farming community. The American Legion Post 539 is an interesting spot in town as well. The hall there is used for many gatherings including weddings, charity functions, and of course, bingo night. Next to the hall, there is a playing field used for baseball and soccer. In the evenings, one can see the bright lights shining down on members of the catholic Church. Youth Organization or CYO as they compete in friendly games. The St. Hedwig Volunteer Fire Department is definitely an important part of the small town. The town got its first fire truck in 1942, sixteen years before it got its firehouse in 1958. Since then, they have got a new fire house and new trucks. The station responds to approximately 60 fires a year, mostly brush fires, as well as about 50 EMS calls. They also help various organizations such as the Catholic Youth Organization and American Legion with fund-raising efforts. The department itself is funded by annual dues and money collected at their annual picnic, as well as funds from Bexar County. Until 15 years ago, Mayor Albert Strelczyk was the fire chief. Now his son, Albert Jr. carries that title. A necessary item in every town is a post office. The St Hedwig post office opened on July 27, 1860. The post office was actually located on the side of the social club for several years until a new building was erected down the street. The St. Hedwig post office is one of the last towns still running on the pony express. The last focal point in St. Hedwig happens to also be the busiest. The convenience store, located at the corner of FM 1518 and FM 1346, is the main reference point in town. The four-way stop, noted for the town’s only traffic light, is commonly called “Four Points.” On the opposite corner from the store stands two large water towers belonging to the East Central Water Supply Corporation. Almost everyone in St. Hedwig passes by this spot daily which makes it a very good spot for business, especially since the next nearest gas station is miles away. To the normal passer-by, St. Hedwig may appear to be just as boring and dull as the next small town, and in some minds, it is. St. Hedwig is not a spot of great excitement or famous landmarks, but the inhabitants have every right to be proud of their home town. St. Hedwig was built on a tradition of hard work and religious faith. Since the first day, the community has rarely failed to love and serve their neighbors. The friendly quality can be seen in every four-fingered wave from a passing car. Perhaps with a little exposure, St. Hedwig can be properly recognized as the beautiful Polish town that it has always been. Baker, T. Lindsay. The Polish Texans. San Antonio: The University of Texas Institute of Texan Cultures, 1982. Cisneros-Lunsford, Anastasia. AFirefighters build on past. @ Southside Reporter. 24 Aug. 1994: S1+S5. McGuire, James P. The Polish Texans. San Antonio: The University of Texas Institute of Texan Cultures, 1972. Strzelczyk, Albert. Personal Interview. 27 Oct. 1998. Originally written in 1998. This has been the History of St. Hedwig, Texas, as compiled by Kris Mylius and Michelle Stiefer. Thank you for your attention as we shared with you the product of our extensive study. We hope that you found it as interesting as we did.